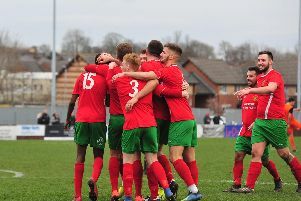 Harrogate Railway manager Craig Ogilvie insists that the club’s fate is still in their own hands as they head into the business end of the season. The Starbeck club find themselves bottom of the NCEL Premier standings following a run of three consecutive defeats to a trio of the division’s title hopefuls. Yet one victory is currently all that would be required to lift the Rail out of the relegation zone and above fellow strugglers Hall Road Rangers and Goole AFC. “In my opinion, it’s still in our hands and we can still get out of this,” Ogilvie said after Tuesday evening’s home loss to high-flying Worksop Town. “I think that we’re in the best position out of the teams who are down there [near the foot of the table] because of who we have got left to play. We’ve got seven of the bottom nine coming up. “It’s up to us to start picking up some results. We need wins now, it is as simple as that. The Rail fell behind after 28 minutes of Tuesday’s contest against the in-form Tigers. Steven McDonnell’s cross found Matthew Sykes and he in turn flicked the ball into the path of Craig Mitchell who finished well. Home stopper Joe Wilton was forced into action on a number of occasions as the game wore on, but the visitors were unable to add to their tally. 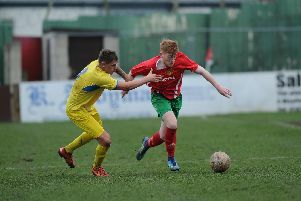 At the other end, Fatlum Ibrahimi, Fraser Lancaster and Adam Turner all had efforts at goal, though the hosts’ cause was made all the more difficult when Steve Smith was sent off for a second bookable offence in the 73rd minute. Worksop eventually capitalised on their numerical advantage, notching their second of the evening in stoppage-time after Steven Woolley threaded a pass through for Sykes to finish through Wilton’s legs. “If I’m honest, I don’t think that you could say we deserved any more than a point, simply because we didn’t test their goalkeeper enough," Ogilvie said. “We gambled and changed our formation and I was pleased with how we played against a really good side. “Worksop were time-wasting with 25 minutes to go, which shows they happy with 1-0. The second goal was harsh on us, but I'm not sure that we did enough over the course of the 90 minutes." Railway host 13th-placed Athersley Recreation on Saturday, 3pm kick-off at Station View.